Will Texas be the next open carry state? Texas will be the next open carry state if Representative George Lavender has anything to say about it. The Texarkana Republican says he will push for a bill in the upcoming 2013 session. Under the bill proposed by Rep. Lavender, those holding a concealed carry permit would no longer be prohibited from carrying their firearm openly. This mimics the successful open carry bill in neighboring Oklahoma which passed in 2012. This entry was posted in Licensed Open Carry, Open Carry, Texas. Bookmark the permalink. 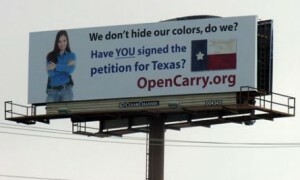 1 Response to Will Texas be the next open carry state?